Before I share the latest and greatest project we’ve tackled here at Heardmont, I wanted to give y’all a quick heads-up. 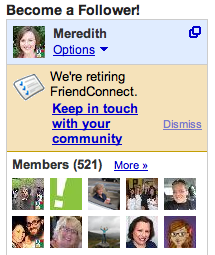 First off, Google is retiring Google Friend Connect for non-Blogger blogs (ours is a WordPress blog, so it’s going away for us). That means if you read our blog solely because you clicked Follow in the box that looks like this, you won’t be seeing our posts after today (Feb. 29). The good news is there’s a new way to keep in touch. 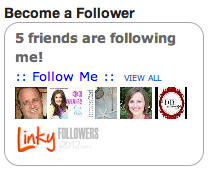 It’s called Linky Followers, and you can become a follower of Welcome to Heardmont by clicking ::Follow Me:: in the Linky Follower box on the right sidebar of our blog. It should look like this! If you manually subscribed to our blog in Google Reader (my favorite way to browse blogs), or if you visit our site directly, this change won’t affect you. We’re also hoping to have a Subscribe by Email option in the near future, so stay tuned! 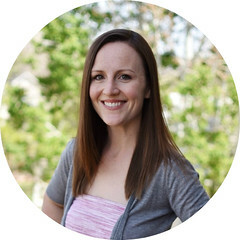 When Stefanie asked me to send her a post about our master closet a few weeks ago, she got me thinking about small tweaks we could make to the room to eek out just a bit more functionality. Most of the updates we made are still going strong, but my biggest complaint was that the jewelry board I made wasn’t big enough. At the time, I was just working with what I had on hand, but stacking multiple necklaces on the same hook was getting awkward and frustrating, so I decided an upgrade was in order. I found a bigger bulletin board in my art stash (got it for about 10 bucks at Walmart awhile back), covered it with a piece of gold material (flashback to senior prom!) 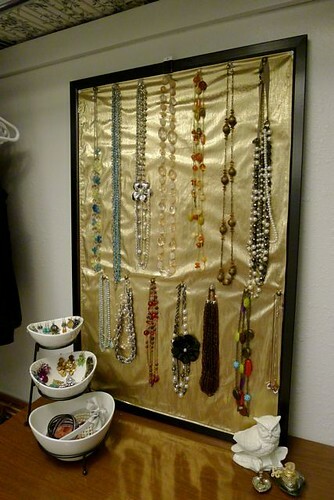 and had a new jewelry board in a matter of minutes! Now the only necklaces that are doubled up are my lightweight dainty ones and all the big mommas get their own hooks. 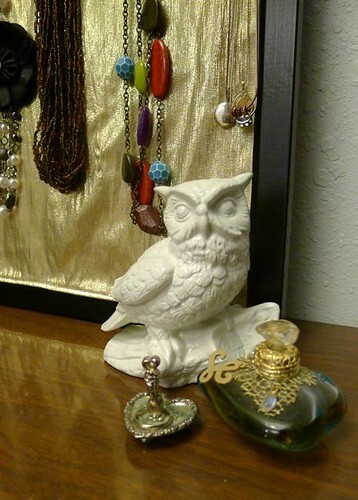 The new jewelry board fills the empty space above the dresser really well, too. 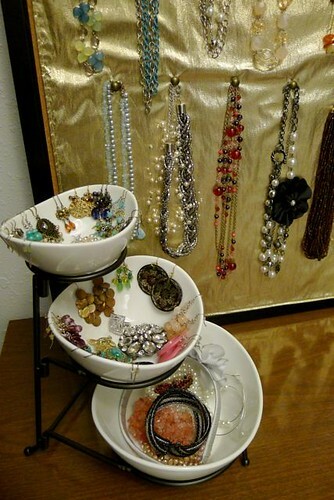 I’m still using my chip ‘n’ dip bowls for earrings and bracelets. That’s one solution that has worked beautifully so far! You might have noticed the board seems to be leaning on the wall behind my little dresser. It is leaning, but I have a little nail and “stopper” at the top to keep it from falling forward. I just colored a bit of foam board black where it overlapped the frame and left the other part white to blend in with the white walls. From a little further away, you hardly notice this makeshift stopper, and from even further away you can hardly see it at all. 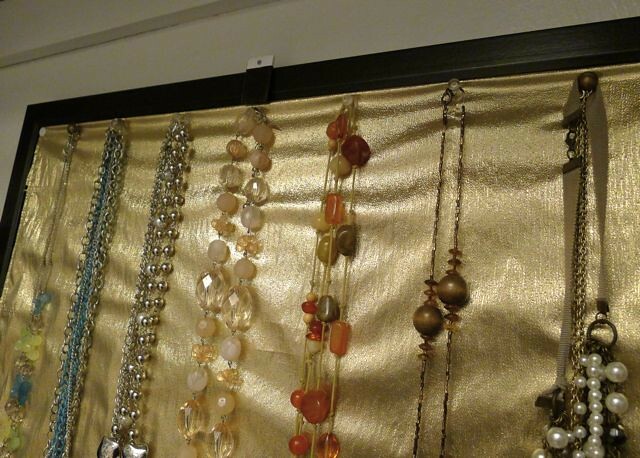 I used a couple different kinds of tacks for hanging the necklaces. I ran out of clear thumb tacks after hanging the first five, so I had to scrounge around for something else to use. The solution? 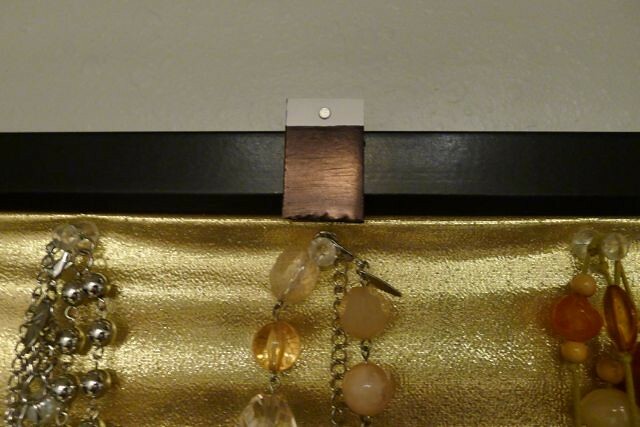 Nailhead trim tacks leftover from this headboard project. Can you see the difference? I actually like the nailhead tacks a bit better because they’re more finished-looking, so I might be switching out the clear thumbtacks in the future. So there’s one simple (free) change we made to make our closet even more functional. We’re still loving all the other updates we made, but you know if anything else in this room ever stops working for us, we won’t hesitate to tweak it! 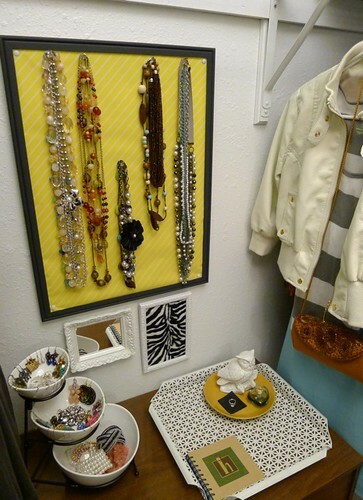 What do you think of the new and improved jewelry board? P.S. Don’t forget to become a Linky Follower or add our blog to your Google Reader if you don’t want to miss a thing here at Heardmont. Thanks! 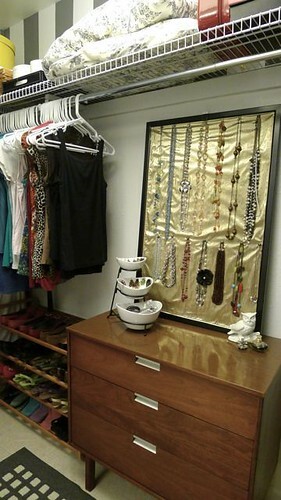 This entry was posted in Before and After, Home Decor, master closet and tagged jewelry board, nailhead trim. Bookmark the permalink.